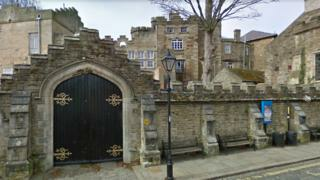 Allegations of abuse at a scandal-hit school were dismissed as "groundless", a report leaked to the BBC has shown. Dozens of boys are believed to have been sexually and physically abused at Stanhope Castle in County Durham over 20 years. The document from 1979 says bosses found claims of abuse made over a three-year period had "no foundation". One former pupil has told the BBC he was repeatedly attacked after being sent to the school aged 14. The report - written for the Department of Social Security and Cleveland County Council - revealed a staff member had been suspended for "incidents of ill treatment" during that time. Michael, not his real name, was abused over a two-year period while Stanhope Castle was under the control of Cleveland County Council. He passed the BBC the report. He was taken into care aged six after violence in the family home. Aged 14, his social worker decided he was to be sent to the school. "The other lads were saying 'the last thing you want to do is go to Stanhope Castle' and 'if you go to Stanhope Castle you've had it'. "They never said why, it was just notorious. I never knew why at the time," he said. Michael said he quickly learned what they had been talking about. He remembers seeing a boy being struck to the ground on his first day. On the second day, he was "cracked across the back" with a walking stick as violence became "a daily occurrence". "I was laid across a desk, naked. A staff member started whacking me with the cane," he said. "I had about 30 strikes across bare flesh, I was nearly unconscious. I'll always remember being on my hands and knees in the shower watching the blood swirl into the sinkhole." Michael was also sexually abused on multiple occasions. "I told my social worker about the abuse but I was taken back to Stanhope Castle. The next morning I had my face smashed against a wall several times. "My nose was broken, I lost a lot of blood. I was sent to the sick wing and refused hospital treatment. "My abuser looked down at me and said 'in future - keep your mouth shut'." The approved school was controlled by the Home Office until it was passed to Cleveland County Council in 1974. Middlesbrough Council then took over its liabilities, with the school closing in 1981. The 1979 report was written to address concerns over the school's methods. It concluded more training was needed for all staff, with "too few" being qualified to care for children. A recommendation was made for the school to close if "significant progress" could not be made within 12 months. Michael reported his abuse to Durham Police in 2016. The case was thrown out because of a lack of evidence. He said reading the 1979 report did not shock him. "Cleveland County Council knew what was going on," he said. "I'm not saying this is Middlesbrough Council as we know it today, they are completely different things. "I believe that the abuse carried on for the next two years, and the council closed the school before there was a major inquiry." A Middlesbrough Council spokesman said its lawyers had "considered all available evidence" and the council "would assist survivors and their partners" to access health services. A number of survivors of abuse at Stanhope Castle have given evidence as part of the Independent Inquiry into Child Sexual Abuse. The inquiry was set up by the government in 2014 to investigate sexual abuse claims against local authorities, religious organisations, the armed forces and public and private institutions.